Well January is just about over. Today is the last day and it’s been a pretty interesting month gaming wise. Mostly I’ve been running and playing in some RPGs. I started a Cthulhu dark ages campaign. The first session went very well. It’s an interesting group of characters who find themselves in a well interesting situation. In December I started a hollow earth expedition campaign but have not been able to get back to. I hope to in February. As for miniatures gaming, I did get in a game of saga. My Anglo- Danes took on Andy Thurlow’s Normans.It was an extremely hard-fought battle. In the end, I was able to pull off a combination attack with my Huscarls that wreaked havoc on his cavalry. It was a slaughter worthy of Hastings. Saga is a great game especially when you know your battle board well enough to pull off some of these combinations. I’m just waiting for it to be done to me. The real problem with miniatures gaming is that I don’t have any tables now. My wife borrowed them for an SCA event. They’ve been gone most of the month by seeing as how my dear Mame has been very supportive of my hobby it’s no big deal. I’ve been using the time to paint more miniatures and organize my stuff as best as I can organize it. My organizational skills are probably not what they should be but hey at least I can tell funny stories. So January has been kind of quiet gaming wise for me I hope I can pick it up in February like to do some more managers can try out a new rule set for medieval combat called lion rampant. I’ll probably blog about that soon. Until next entry, have fun playing games! Farewell to 2014 and a Look Ahead! Well, 2014 is pretty much in the rearview mirror and 2015 looms ahead. All in all,2014 has been a good year for gaming for me. Here are some of the highlights along with some plans for 2015. SAGA marches on! 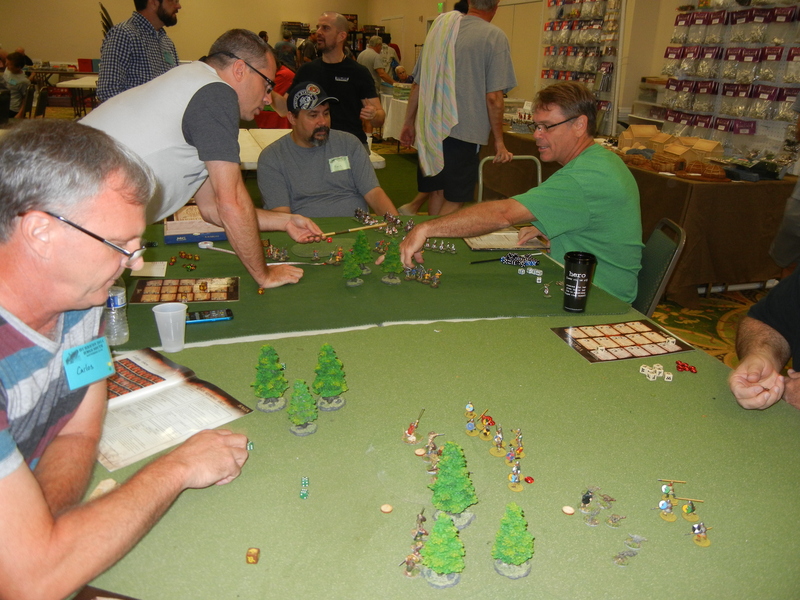 I ran my first SAGA Tournament in September at HMGS-South’s Hurricon convention. It was a great weekend. I was pleasantly surprised at all the interest that was shown in the game. There will be two tournaments held this coming April at HMGS-South’s Recon convention. I also got Crescent and Cross which is the next rules book in the SAGA line. It covers the Crusades. I’m slowly building up a warband of Knight’s Templars. Fireforge makes some terrific plastic figures. Haven’t really done much with BoB of late. Since my SAGA figures are single mounted, I will stat them up for BoB and have a good old fashioned game of “Pillage the Village”. I still have the stats for my German-American War: 1904 scenario. Lots of new stuff coming up in 2015.